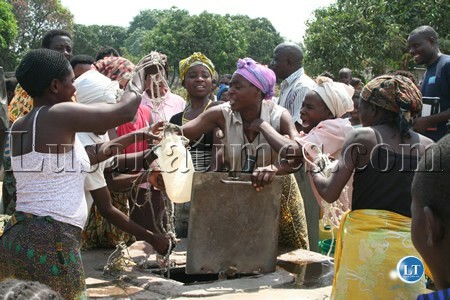 The Lusaka Water and Sewerage Company has suspended the selling of water at its communal taps in Kanyama, John Laing and Chibolya compounds. This is in a bid to allow more people of the areas to access safe and clean drinking water for free during the period of the Cholera outbreak. Lusaka Water and Sewerage Company Public Relations Officer Nshamba Muzungu disclosed this in a statement on Sunday. LWSC CALLS ON LUSAKA RESIDENTS TO DESIST FROM DRINKING WATER FROM SHALLOW WELLS AND UNTREATED WATER FROM PRIVATE BORE HOLES. The Lusaka Water and Sewerage Company has appealed to the residents of Lusaka to desist from using water from shallow wells and other unsafe sources in the wake of the Cholera outbreak in Kanyama compound. In an effort to mitigate the Cholera situation, the company has since suspended the selling of water at its communal taps in Kanyama, John Laing and Chibolya compounds to allow more people of the areas to access safe and clean drinking water for free during the period. Further to that, the company is also undertaking door to door sanitation awareness campaign in Kanyama Compound where it is promoting hygiene and hand washing. In addition the utility has also increased the Chlorine dosage for the water that is supplied by Water Trusts in peri-urban areas and will soon be distributing chlorine to households in peri-urban areas. The utility is expecting to receive about five thousand boxes of Chlorine from UNICEF and will soon be distributing chlorine in all the peri-urban areas regardless whether there have been reported outbreaks or not. Residents of Lusaka are advised to ensure that they access clean and safe drinking water supplied by Utility Company in order to avoid drinking contaminated water and getting infected with waterborne diseases such as Cholera. The spread of waterborne diseases in peri-urban areas can be attributed to lack of adequate sanitation services and the use of water from shallow wells and private boreholes supplying untreated water. The water supplied by Lusaka Water and Sewerage Company is safe, clean and reliable drinking water because it goes through the standard treatment process before it is supplied to the residents of Lusaka. Water quality surveillance is undertaken on a daily basis and therefore, the company is very confident of its water treatment processes and the probability of contamination is zero because of the quality control measures that have been deployed. We would also like to appeal to all those that have not connected their households to the Lusaka Water and Sewerage line to get connected so that they can also enjoy the benefits of clean and safe drinking water. who is going to pay for the Pumping of water t these compound UNICEF or people in Kabulonga??? is this not the same company which is always mentioned when getting loans by GRZ ? a total of $900 million has been borrowed by GRZ mulitple times mentioning this same company if i am not mistaken. Congratulations!!! When the situation gets back to normal, the residents could then start to pay the usual rate. It is easier to control certain tropical diseases by adopting suitable water policies that protect vast majority of people. Elimination of cholera can prove cheaper and more affordable in the long run.